This is a beautiful family-owned luxury cabin that sits nestled in the woods with a feeling of total privacy when enjoying the screened-in deck. There are two master suites that are spacious and offer bathrooms with jetted tubs. The gas stone fireplace offers a cozy warmth in the winter, and the hardwood floors and wood ceiling add to the cozy cabin feel. The furnishings are beautiful and rustic, and there is a fully equipped kitchen and washer/dryer. Wireless internet is provided along with satellite television in the living room and both bedrooms. This cabin is part of the Lodges at Roark Creek area of the Stonebridge Resort community. Here you will find wooded beauty with the sounds of the nearby creek. A beautiful clubhouse is close by and offers a pool, tennis courts, gym, a restaurant, and a business center. There is an additional pool in the Fox Hollow section of the resort you may use -- just choose the one that suits you. The Ledgestone Championship Golf course is just a stone's throw away. Here you will have a memorable, relaxing vacation! My name is Stephanie, and I live with my husband in Kansas City. He is a semi-retired attorney, and I am an accountant. We enjoy spending time with family and friends, and we love to travel. We have two small schnauzers who also enjoy taking trips, and we all love Branson. We came to Branson for a long weekend and stayed in Stonebridge. The area was so pretty with the rolling hills, creeks, and flowers. We decided we would enjoy owning property here so we could come more often. Branson has a lot to offer -- a person can just chill out or take in some shows, shop, go to the lake, etc. This little cabin is very peaceful and when sitting on the screened in deck, it feels totally private because of backing up to a wooded area. In the spring, you can hear the sounds of a distant creek. The warm atmosphere of the cabin is enhanced by the rustic furnishings and modern amenities. Pools, parks, the clubhouse and golf course are just a short distance away. Parking is in front of the cabin and in the gravel area provided. Wireless internet is provided in the cabin. There is a screened in deck on the back of the cabin that overlooks a wooded area. Golf is available at the Ledgestone Golf Course. Tee times may be booked on that website. (2) There are two pools available. One is at the clubhouse, and the other is in the Fox Hollow section of Stonebridge. This cabin is super cute and stocked with everything you could imagine. It felt very secluded and I only heard the train once. Beds are very soft if that’s your preference (I’m a stomach sleeper and woke up stiff a few mornings). Ninja coffee maker and blender were a nice addition. Clubhouse restaurant was very good for breakfast and reasonably priced. Branson West has a lot to offer, too! Would definitely stay again. Wonderful place for get away with friends. We met another couple here for a weekend getaway. The cabin was perfect, the two master suites were great for each couple to have their own space yet the common areas indoors and on the deck made for great time together without having to have the background noise of a public gathering place. The cabin had everything we needed from appliances to dishes to a forgotten bar of soap. Everything was kept immaculate and it was very obviously well maintained. We had a wonderful time and if we decide to meet again in Branson we will definitely request the cabin. Thank you Stephanie for creating such a wonderful getaway! We love this cabin every time we go! This is probably our 6th time to stay at this cabin and we love it more each time we go! The location is perfect— beautiful community secluded from the business of Branson. We so enjoy that we can enjoy the club house pool, the family pool, the club house workout center, and the club house restaurant. We also enjoy all of the amenities stocked in the cabin— we love to cook, even on vacation, and the cabin has everything we need. Even a grill! We can’t say enough about the cabin and it’s comfy beds and we will continue to use it!!! Highly recommend! This cabin is lovely and we would certainly stay here again. It is clear that the owner has thought of things which make the stay better. We have stayed in similar cabins in Stonebridge, but this one has more amenities. You will enjoy this cabin! We had a terrific experience renting this cabin. Communication with the owner was great at the very start. She sent tons of information about the cabin and even included restaurant and entertainment recommendations. We found the cabin to be perfectly clean and ready for our visit. The kitchen was exceptionally well stocked with dishes, utensils, and even tons of spices and cooking necessities. The cabin is tastefully decorated with a country theme, and on our visit even already had Christmas decorations out (we stayed over Thanksgiving), which we appreciated. The wifi and media all worked perfectly as advertised, so the kids were never cranky. The layout of the cabin is great with split bedrooms, each with a master bath. This is the third of this style cabin we have stayed at in Stonebridge and, although we enjoyed them all, this one was our favorite! Our only complaint about these cabins (same for them all) is that the hot water heaters are a little too small for you to really enjoy a hot bath in the jacuzzi tubs. We couldn't quite get enough hot water to fill the whole tub (they are large). 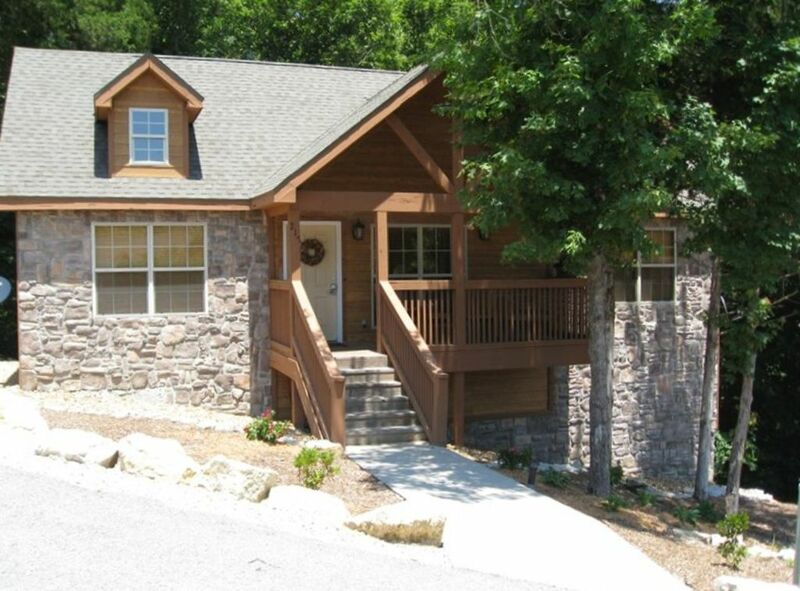 Perfect cabin for a Branson get away! This is probably our fifth time to stay in this cabin and we've enjoyed it every time. The cabin layout is perfect for families and the location makes you feel like you've totally escaped busy Branson. We love having a kitchen to make breakfast and lunch. We will be staying here again soon and time and time again!